Solid Wood hanger with three hooks. Features a bevelled circle pattern on the hanger. The hooks are .. 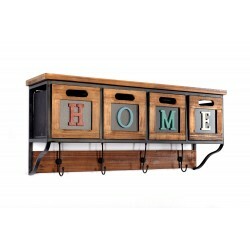 Solid Wood hanger with four hooks. Features a bevelled circle pattern on the hanger. Hooks are 7cm w.. Wooden hanging cabinet with 9 Hooks; 5 double hooks and 4 single hooks. Comes with 4 storage slots a.. Wooden napkin holder with metal and ceramic weight. The overall size is 18.5cm wide, 20cm deep and 6.. Wooden Wall Shelf with 4 Hooks 54 x 10 x 18 cm. Useful wall mounted wooden shelf complete with 4 met.. Wooden Wine Box & Glass Storage Large substantial wooden hanging wine and glasses sto..